Dollops of Diane: Happy 6th Birthday, Daniel! D turned the big SIX on Sunday! 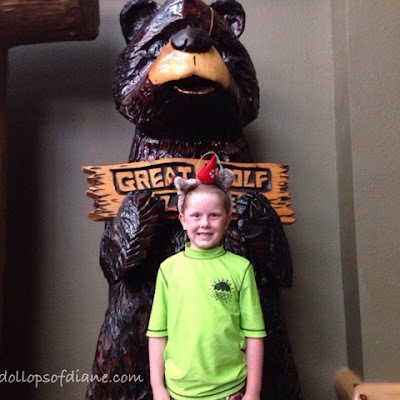 We gave him the option of a party or a trip to Great Wolf Lodge and there was never any real doubt over which he would choose. We had such a fun trip. The last time we went was 2 years ago so Daniel was still pretty young and not able to swim yet. Now that the kids are 8, 7, and 6 they can all swim and were all big enough to go on all the slides. They had a BLAST on the slides - time of their lives! Want more D? You can check out his answers from when he turned five HERE, four HERE, three HERE, his first year in pictures HERE, and his birth story HERE!